I love the fact that you can take a base recipe and get creative with additions, you know, whatever you have at hand, whatever strikes your fancy. You can serve this as a main course, or, as we did, an accompaniment to Crunchy Baked Pork Chops. I love the crunch and flavor Fennel gives this recipe. I suppose you could sub celery, but Fennel gives you a lot of bang for your buck. Hope you like it as much as I do. 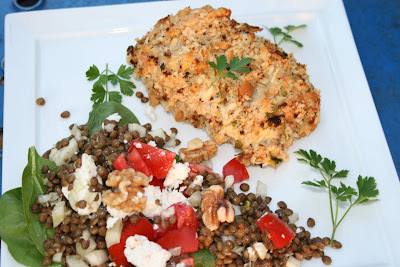 Oh, I have also included Cooks Illustrated's recipe for Crunchy Baked Pork Chops, also very delicious! 1. Combine the water, garlic, bay leaves, onion, and 1 tablespoon salt in a large pot and bring to a boil. Add the lentils, return to a simmer, and reduce the heat to medium, or just enough to maintain a slow but steady simmer. Cook until the lentils are tender, 25 to 35 minutes. Drain, discard the onion and bay leaves, transfer the garlic cloves to a small bowl, and spread the lentils onto a baking sheet to cool. 2. With a fork mash the garlic cloves to a paste. Add the vinegar, lemon juice, and sugar and whisk together; whisk in the olive oil until emulsified. Adjust seasoning with salt and pepper. 3. In a large mixing bowl, combine the cooled lentils, thyme, parsley, and fennel. 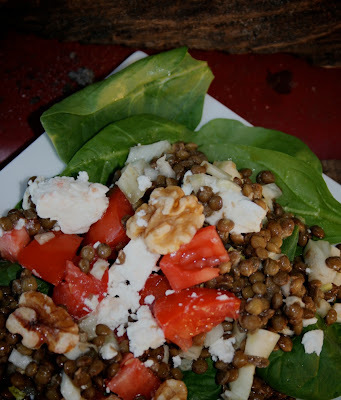 Drizzle the vinaigrette over the lentils and fold the mixture with a large rubber spatula until well blended. Suggested Additions: sliced radishes, chopped tomatoes, Feta cheese, walnuts, pickled onions. I loved the addition of tomatoes, Feta and walnuts. Taste and adjust the salt and acidity prior to serving. That does look good...great flavours here. I also love the salad you've served on the side; the serving suggestions are fun too! Very yummy post Sandra! 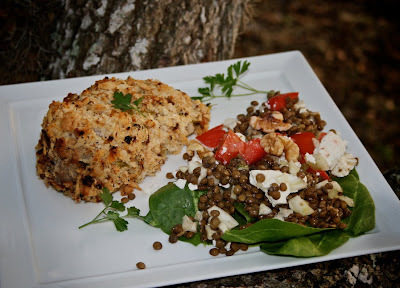 That is a nice looking lentil salad. PAB and Kevin thanks for the comments. I think you'll like both recipes when you try them!